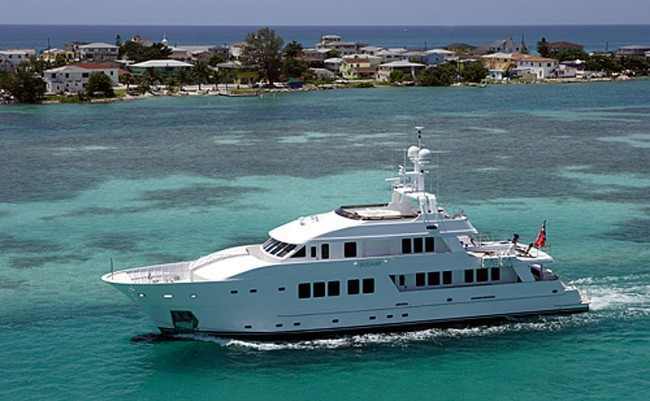 Experience Luxury Aboard Our 111′ Inace Motor Yacht! Waverunner, 2 kayaks, water skis, wake board, big banana, towables, windsurfing equipment, snorkel gear, extensive fishing gear, water trampoline. Main deck forward of the main saloon and dining areas. The master suite provides complete privacy with a private lobby area offering personal laundry, fridge, tea & coffee making facilities. The spacious suite spans the full width of the boat and includes a large en-suite equipped with makeup dresser, a separate toilet & bidet, his and her wash basins and a full walk in wardrobe. Two identical QUEEN staterooms side by side extend across the full width of the boat. Forward are two identical TWIN staterooms with two single beds and a well concealed Pullman berth. All the suites are mahogany interior and have distinctive Brazilian granite en-suite bathrooms. Each stateroom is ensuite with flatscreen TV/DVD/CD. Staterooms are located amidships on the lower deck, accessed from the guest lobby. The main saloon and dining area are on the main deck and feature mahogany woodwork with large side windows providing excellent views. Looking forward from the aft deck, the salon is arranged with an inviting sofa area to port while on starboard a fridge offers guests cold drinks. The well equipped galley is forward of the dining area so chef and stewardess are always handy for meal service or a casual snack if required. An office is located between the wheelhouse and sky lounge on the upper deck. Here you will find a comfortable day bed and private desk space with telephone. This space can also be used for yoga or meditation. Yoga mats, Exercise ball and hand weights can be found in this area. The sky lounge offers another comfortable sofa area with large flat screen Satellite TV and entertainment system. A full service bar and fridge accommodates guests beverage requests. The wheelhouse with its raked back windscreen is above the owner’s suite. An internal staircase leads down to the captain and crew quarters. Two pedestal leather helm chairs occupy the space forward allowing the captain and crew to operate the state of the art navigation and electronics onboard. Protected dining area for 10 where a buffet breakfast is served. The boat deck transforms from a tender and toy area to expose a raised dining area partially covered where one can sit and enjoy the beautiful surroundings. Accessed from an external staircase leading up from the boat deck. The outside helm station is forward while the remainder of deck is given over to a 6 person Jacuzzi, which is surrounded with large sun beds & teak steamer lounge chairs. An optional sun shade can be erected if required. A full service bar equipped with BBQ, fridge and ice-maker make it the perfect place to enjoy cocktails at sunset. The aft swim platform offers a large area for those swimming and using the water toys to board the boat. An outdoor shower is located on the swim platform for your convenience so you can rinse off after a swim or water-ski.